The Washington Capitals travel to Amalie Arena to play the Tampa Bay Lightning on Monday, October 9, 2017. The opening line for this game has the Capitals at -109 and the Lightning at -114. Washington had a record of 55-19-8 last season and on the road they had a record of 23-12-6. They finished 1st in the Metropolitan Division. They scored 263 goals and gave up 182 goals for a point differential of +81. For the season they had an ATS record of 62-33-0 and an over/under record of 43-38-0. Tampa Bay finished with a record of 42-30-10 including 23-14-4 at home last season. They were 5th in the Atlantic Division. They scored 234 goals and surrendered 227 for a goal differential of +7. Their record against the spread was 42-40-0 while their over/under record was 38-38-0. Nicklas Backstrom accumulated 85 total points last season for the Capitals. He had 23 goals last year with 160 shots on goal giving him a shooting percentage of 14%. He had a total of 62 assists on the season and averaged 18.3 minutes played per game. Alex Ovechkin averaged 18.4 minutes of ice time per game last year. In that time he had a shooting percentage of 11% by scoring 33 goals on 305 shots. He had 35 assists giving him a total of 68 points on the season. Braden Holtby had 42 wins and 13 losses last season in net for the Capitals. He had 1,690 shots against him and he gave up 127 goals. He made 1,563 saves for a save percentage of 93%. Victor Hedman scored 70 total points last year for the Lightning. He had 15 goals last season with 164 shots on goal giving him a shooting percentage of 9%. He had a total of 55 assists on the season and averaged 24.5 minutes played per game. 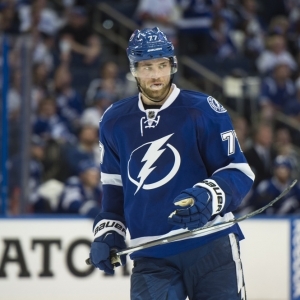 Nikita Kucherov averaged 19.5 minutes of ice time per game. In that time he had a shooting percentage of 17% by scoring 40 goals on 243 shots. He had 44 assists giving him a total of 84 points on the season. Andrei Vasilevskiy had 23 wins and 17 losses last year in goal for the Lightning. He had 1,480 shots against him and he surrendered 123 goals. He made 1,357 saves for a save percentage of 92%. The Capitals had 118 total points last season, which ranked them 1st in the NHL. They were 3rd in the league in goals scored with 263 while they gave up 182 goals, ranking them 30th overall. They had 248 power play opportunities and scored 57 goals on those chances for a percentage of 23%. That was 4th in the NHL. The Capitals allowed 272 power play opportunities and gave up 44 goals on those chances for a penalty kill percentage of 84%, putting them 7th in the league when short-handed. They averaged 30 shots per game and as a team shot 10.54% for the season. They allowed 28 shots to their opposition per contest and had a team save percentage of 92%. That put them 2nd in the league in stopping the puck. The Lightning were 18th in the NHL with a total of 94 points last year. They had 62 power play goals on 272 opportunities for a percentage of 23%. That ranked them 6th in the league as a power play unit. They allowed 258 power play opportunities and gave up 48 goals on those chances for a penalty kill percentage of 81%. That was 13th in the NHL. As a team, the Lightning were 14th in the league with 234 goals scored while they gave up 227 goals, which was 15th overall. They averaged 30 shots per contest and had a team shooting percentage of 9.54%. As a team they gave up 30 shots per game and had a save percentage of 91%. That was 16th in the NHL. Who will win tonight's Capitals/Lightning NHL game against the spread?